Clyde manager Danny Lennon (picture by Michael Gillan). Clyde gave themselves a lot more to do in their bid to reach the promotion play-offs after slipping to a single-goal defeat against the basement club. The Bully Wee were the superior outfit in the first half at Central Park and had a far greater share of the attacking moves, with Cowdenbeath only really catching sight of their opponents’ goal towards the end of the opening 45. But the hosts had defended fairly resolutely throughout and matched that with more enterprising play in the second period. In the end, it all came down to a tale of taking half-chances, with Brad Smith grabbing the only goal in the 69th minute to keep alive Cowdenbeath’s slim hopes of existence in League 2. Clyde now have the task of overtaking Elgin City and Stenhousemuir take fourth spot, with Stenny having a game in hand. The Bully Wee settled into a reasonably early attacking rhythm, with a very good opportunity in the sixth minute. David Goodwillie weaved and twisted into the box and laid off for Ally Love, but the striker failed to get hold of the ball properly and sliced his shot wide. Harvey Swann made a vital block from Goodwillie eight minutes later, after Love had turned provider to put the forward through. Cowdenbeath’s first meaningful effort came after 21 minutes with a snapshot from Jordyn Sheerin which sailed narrowly over the bar. Another very good chance came Clyde’s way in 26 minutes, when a long clearance from his own penalty area was lofted upfield by Martin McNiff, towards Goodwillie. The team captain once more dodged and contorted his way past the defence to feed Love but, again, the close-range shot was wide. Seconds later, Chris McStay floated in a corner which was headed towards goal by Dylan Cogill but nodded off the line by Fraser Mullen. Ten minutes from the break, Kieran Duffie was back to mop up a dangerous looking cross from Cowden’s Robbie Buchanan, after a pass from David Cox. A free kick from halfway by McNiff was held up for Goodwillie in the box but the effort went over. Smith signalled Cowdenbeath’s intent in the 43rd minute with a long, unchallenged run into the box but his shot posed virtually no problems for Blair Currie in the Clyde goal. Shortly before the whistle, McStay was bizarrely flattened when a free kick from one of his own players slammed into the back of his head. Five minutes into the second half, Cowdenbeath went close wehn a throw-in from Jamie Pyper landed in the box and Barry Cuddihy cleared Cox’s attempt off the line. McStay played a fine ball through to Goodwillie on the left, and he looked in a fine position to score as the hour approached. But his shot was very well saved by David McGurn, who pushed the ball away to his right – and Clyde were thwarted again. In 69 minutes came the decisive moment, as a mini-surge forward by Cowdenbeath saw the ball played out to substitute Cameron Muirhead on the right, and his cross was deposited low into the net by Brad Smith. Rain began to make the previously good conditions greasy and awkward but both sides battled on. Six yellow cards were shown in the second half – among them one for keeper Currie, who had been metres out of his goal to take a last-hope free kick and brought down Buchanan on his return journey, and substitute Steve Kipre, for a stoppage-time foul on Cowden’s man of the match Bryan Gilfillan. Afterwards, manager Danny Lennon said: “I thought we had a good spell in the first half, particularly in the first 20 minutes of the game. We had a few half chances, and you have got to take them. In the second half, I’ve got to give them (Cowdnebeath) credit. I didn’t think we got going in terms of the service we could get up to the forward area, and that is credit to they way Cowdenbeath came out and played, or were committed in the second half. I thought their two centre backs were excellent – it was the best I have seen two of them handle Goodwillie in that situation. “But our choice of pass in that final third was more often wrong than the right one, and you have to give Cowdenbeath credit. 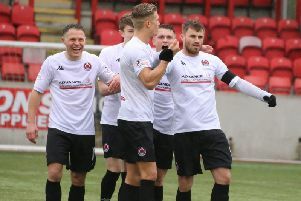 Lennon added the challenge of the play-offs was even greater now, with Stenhousemuir having a positive result on Saturday, and games in hand on top of Clyde and Elgin City. “What they have to do is go out and make them count, in the same way we have to make the next three games count,” said the boss, adding he would settle for three wins. Lennon summed up: “I thought we caused Cowdenbeath one or two problems in the first half, in terms of getting good territory into their box. In the second half, we did ask them to go out and switch the ball about a wee bit more and we didn’t really do that, becasue I felt they got in amongst us and stopped our creativity. Cowdenbeath - McGurn, Mullen, Swann, Pyper, Gilfillan, Miller, Cox (Muirhead 62),Reilly (McInally 88), Sheerin, Smith, Buchanan, Subs (not used) Penman, Rumsby, Smith, Hornby, Fotheringham. Clyde – Currie, Duffie, Stewart, McNiff, Cogill, McStay (Kipre 84), Cuddihy, Grant, Goodwillie, Lamont (Martin 77), Love (Boyle 66). Subs (not used) Gourlay, Lowdon, Millar, Wright.